The Little Cooking Pot swings by Sri Lanka tonight for a sunshine and coconut filled three-course meal that will definitely lift you out of a cold, grey Hackney night in March. On the menu is dhal with tamarind and roti, spring greens and chick pea curry, courgette with green chillies, coconut red rice and squash. Dessert is raw chocolate and ginger tart. It's all vegan, in case you hadn't already noticed, tickets cost £25 and it takes place in Stokie's Bodega 50 from 7.30pm. Tickets from here. OK, this might be the Jump The Shark moment for national food days/weeks/months. Actually, thinking about it, we probably reached peak week a long time ago. 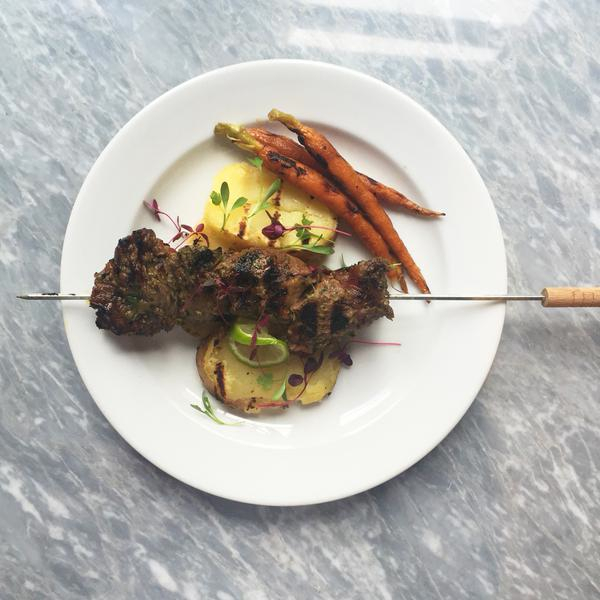 Anyway, this Saturday is the tenuous "Something on a stick day" (no, really), and a day earlier, En Brochette are cooking up a Keep It Skewered" supperclub downstairs at an ad agency in Shoreditch. On the £35 menu are canapes, a cocktail by the excellent Soulshakers then all manner of things on sticks: six-hour pork belly with truffled apple sauce and lots of other quality meats too. It starts at 7.30pm, so go grab your tickets from here. Here's your chance to put a little something good back into the community - and enjoy some decent food too. Spring Up: For Hackney Homeless is a one-day, charity street food event taking place at St John at Hackney from 10am until 6pm. Expect delicious food stalls like Grill My Cheese, Kusina Nova, Happy Herefords and Holy Guacamole, along with craft beer and cocktails. Plus, for the kids there's a jungle bouncy castle, face-painting and even a live set from Peppa Pig going b2b with George Pig. Or something like that. Anyway, it's free entry and all proceeds go to The Big Issue Foundation, so get yourselves down there. All the deets here. It's the launch of the Broadway Market Taste Sessions on Sunday and the first spotlight will be on the amazing produce from E8's favourite fishmongers, Fin and Flounder. The Taste Sessions crew - headed up by Alistair Maddox as head chef this time - will be taking over Hill and Szrok's kitchen and will be serving up some of F&F's fancy fish as part of the £40, seven-course feast. It starts at 3pm and tickets can be bought from the shop, or by emailing: info@broadwaymarket.co.uk.